Feeding your feline optimal nutrition not only requires an understanding of your cat’s unique nutritional needs, but also of their feeding behavior. In fact, understanding the nuances of feline consumption can help combat one of the most common feeding disorders in cats - obesity. When it comes to feeding behaviors, domestic cats aren’t vastly different than their wild cousins. Felines are so fundamentally predatory that they will actually stop eating a meal to initiate a new hunt. This instinctual strategy evolved in the wild over the course of millenia to maximize food availability. This is why, if a cat even sees a mouse, she feels compelled to catch it. Domesticated cats exhibit this same hunting impulse, and sometimes pet parents mistake feline hunting behavior as an expression of hunger. However, it’s simply a manifestation of their predatory instinct. It might amaze you to learn that cats in the wild consume 10-20 small meals per day! And 40% or more of the diet of feral domestic cats consists of small rodents, but the typical mouse only provides a tiny amount of the daily energy requirement of an adult cat. In order to obtain enough calories, a cat must hunt throughout the day and night. Generally speaking, domesticated cats demonstrate similar behavior, ‘snacking’ throughout the day on their kibble and canned food. The significant difference here is that prepared food features substantial calorie counts, especially compared to a field mouse. With many indoor kitties adopting the couch-potato lifestyle, a sizable portion of the U.S. cat population is overweight or obese. A major concern that affects overall health, obesity was nearly unheard of in cats 100 years ago. In a relatively short period of time, cats have gone from outdoor predators, constantly searching for small prey, to indoor loafers with a nearly constant supply of freely available food! No longer subjected to the daily hardships of environmental dangers (such as predators, rampant disease, increased risk of traumatic injury and at the mercy of the elements), cats are not only falling prey to obesity, they are suffering from collateral disorders like arthritis and diabetes. Simply by adopting new methods of providing sustenance, pet parents can not only help their indoor cats avoid obesity but also boredom … talk about a win-win scenario! 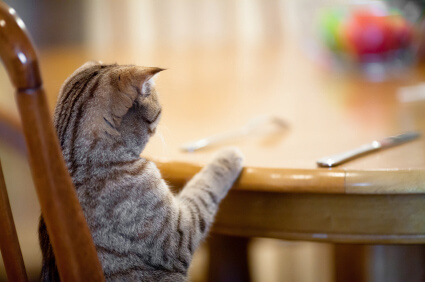 Unless your cat is hyper-vigilant at regulating her caloric intake, the amount of food for the day should be measured out to prevent overeating. Resist the temptation to ‘feed the empty bowl’. A good reality check is readily available in the form of the Suggested Daily Amount listed on the back label of Life’s Abundance food bags. It’s important to note that neutered and sedentary cats have lower energy requirements than outdoor hunters or extremely active kitties. Food intake should be adjusted according to a cat’s activity level, to help maintain an optimal body condition. Remember, a cat is at a good weight when you can feel ribs, but not see them. It’s always a good idea to discuss weight management issues with your veterinarian. *Use a puzzle feeder or food ball to dispense food as a challenge. Or make your own homemade puzzle feeder by cutting holes into a taped-shut shoebox or empty two-liter bottle, either with holes large enough that she can paw kibble out, or kibble-sized holes that will dispense food as she bats the container around. Begin with easy-to-solve puzzles … as your smart kitty works out the chow challenge, introduce new, more difficult mealtime mystifiers. *Hide food throughout the house … be creative and change up locations frequently, effectively recreating a ‘scavenger hunt’. *Throw kibble for your cat to chase, to mimic pursuit of prey. *If you feed treats, make sure the calories for those treats are reflected in the total daily counts. *Make sure all the members of your family are on the same page when it comes to curtailing feline obesity. That means, no duplicated feedings or treating. *If your kitty stares at you with longing eyes during meal time, then feed the largest meal during that time to prevent begging. *If your kitty pounces on you at night demanding to be fed, then feed the largest meal right before bedtime. If you feed your cat Life’s Abundance Premium Health Food and Instinctive Choice Premium Canned Food, you obviously care about improving the health of your cat. Just keep in mind, there is such a thing as too much of a good thing. I truly believe that if you make the commitment to alter your feeding habits, you can make a big difference in the long-term health of your furry best friend. Any chance Life's Abundance will develop a lower calorie weight loss cat food (kibble) to help shed some pounds? I love the suggestion of making feeding a game for my cat, but I also have a dog in the house. If I put down a puzzle ball filled with treats, the dog would definitely get to it first! Any suggestions for two pet families? I love this information Dr. Jane has given about cats. I have 2 cats who stay indoors, but who still love to play. I will use some of these ideas so that they do not become obese. They are 6 years old and at good weights. They love to fetch, but never thought about having them fetch for their treats or supplements. I will try that. Thanks so much. I have a dog and two cats. To keep the dog away from a puzzle ball filled with kibble, I put it in the bathtub. Kitties jump in but the dog avoids the slick surface. I will try the fetch game for treats. Thanks for the great article! I suggest working with your veterinarian to determine the exact calorie count your cat should be consuming each day to shed unwanted pounds. Also - feeding a combination of wet and dry food will help your cat stay hydrated while feeling fuller because of the higher water content in the canned food. I love the idea of putting the gamecube in the bathtub. Great idea! Great tips! I'm concerned about my two overweight neutered males. I'm attempting to switch them to only wet food (one of my boys always has UTIs and won't drink water). But I'm also trying to help them lose weight. Right now they're getting one 3oz can a day, divided into meals. They're 14 and 17 lbs. Is that enough food? How many calories are in one 3oz can of your wet food? Thanks! I'm really inspired along with your writing talents. Is that this a paid topic or did you modify it yourself? Anyway keep up the nice high quality writing, it is uncommon to see a nice blog like this one today. Howdy! I just wish to offer you a huge thumbs up for the excellent information you've got here on this post. I am coming back to your web site for more soon. I have 3 male cats 1 is 9 and 2 are 7. all indoor cats. If I order Life's Abundance food for them what do you suggest for a 30 day supply. They currently eat wet food in the morning and I leave dry food out all day. Thanks so much for your interest in our products! We would recommend our 16 1/2 pound bag of our Premium Health Food for Cats. This bag holds 66 cups. It's hard to know for certain if this food will last 30 days, due to the free feeding, but should work well for your needs. This is the largest bag of dry cat food that we offer our customers. As far as canned food, our Instinctive Choice formula comes in 24-packs, so we'd recommend buying at least one of these, too. Hope this information helps, have a great day!